Some people might assume that because there has been little talk of Beirut’s archaeological excavations in a long time, that all is well on that front. The law requires archaeological excavations to be supervised either by an archaeologist with relevant experience from the Directorate-General of Antiquities (DGA), or a qualified academic from a university or archaeological institute. This law was applied diligently, even during the heyday of Solidere with all its thuggery. The company brought in a total of over 20 teams from Lebanese universities and a number of European and other institutions to help oversee various sites. Since 2005, the Lebanese University has been excluded from any excavations in Beirut, ostensibly because it lacks the necessary funding. Foreign universities were excluded too on the grounds that they cannot provide better care for Lebanon’s antiquities than the Lebanese themselves can, and that the foreign academics only come for the money (although these foreign teams are self-funded, and do not cost Lebanon anything). To fill this contrived vacuum, all archaeological excavations in Beirut were entrusted to a private company, which was established by individuals who were still students, none of whom had yet gained a master’s degree. This company, naturally, seeks to make a financial profit, making it possible for the goal of safeguarding the country’s heritage to be compromised. It is standard practice for researchers working on archaeological digs to publish preliminary reports in which they provide details of their finds for the benefit of concerned specialists and others. The DGA magazine Baal, is in a peculiar position in this regard. All the scientific teams which took part in excavations in Beirut in the 1990s published their reports and findings in a professional and serious manner. These were in keeping with established scientific and academic standards, and provided more than enough material for several issues of the magazine, giving us a textual, photographic, cartographic, and diagrammatic record of everything that was unearthed in Beirut. Yet for the past six years or more, Baal magazine has been completely devoid of any reports of, or data about, excavations in Beirut – even though these have continued unabated throughout this time. The main reason for this, in our opinion – unless there is a concealed reason – is that those carrying out the excavations have not yet acquired enough of the technical capacity, academic methodology, or functional expertise needed to publish the findings. In practice, this means that about 70 archaeological sites have been allowed to disappear without a trace, either physical or photographic. During the heyday of Solidere and its thuggery, I was involved in a number of hard-fought campaigns aimed at protecting archaeological sites. We were, and remain, convinced that some ruins unearthed during construction of buildings need to be kept where they are, both to testify to Beirut’s magnificent history, and also to serve as tourism and cultural attractions. Despite threats and attempted bribery – and despite Dutchman Hans Curvers’ theory that no archaeological find need remain in situ – we managed, with the help of UNESCO and the international committee it set up, to secure the preservation of a few sites: The Ancient Hill, The Phoenician Quarter, and the site of the Small Palace. Since 2005, about 70 sites have been excavated in Beirut. Everything found in them to this day has been removed, except from the newly-uncovered Mina al-Hosn site, which was the target of a dubious deal aimed at digging it up too. What is the difference then between the actions of Curvers – whose prosecution and deportation we repeatedly called for – and those of his Lebanese successors? At least Curvers kept meticulous records and published his reports in Baal magazine. The private company has yet to publish a single scientific report. 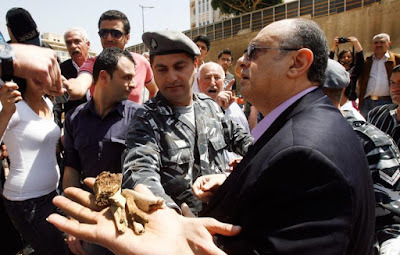 This must rank as one of the worst failings ever in the history of archaeology in Lebanon. Is it conceivable that not a single ruin worth preserving has been found in the ancient heart of this capital, despite the great expanse of the area excavated, and the numerous locations involved? Who decided that? Who is responsible for the decision to uproot our history from the ground of Beirut? Bemused and astonished, it is our right and our duty to ask. The Ministry of Culture controls the DGA, and as such is entrusted with Lebanon’s antiquities and historic heritage. Its officials are supposed to be duty-bound to defend our ancient legacy – or at least that is how we understand the concept of performing one’s national duty. But what is the reality of the situation? Since last August, Minister of Culture Gaby Layoun, has surrounded himself with a small committee composed of what he has described as academics. We warned him at the time that this was a serious mistake, as the committee – controlled by the self-styled “Jupiter” of archaeology throughout the Levant – will be the undoing of the DGA. There are many reasons why we made this assertion. First, the committee brings with it dreams and prejudices that are unrelated to heritage or archeology. Second, it will cover up scandals rather than opening files and reforming what needs to be reformed. Third, it will create a contrived vacuum by excluding foreign experts and belittling Lebanese specialists – because “none of them deserve the PhDs they hold” – so that it can assert its own control over the DGA. Finally, it is our belief this committee will exact revenge against certain “hostile” staffers, by way of settling some of its members’ old scores. Sadly, what we used to warn against is now actually happening. Indeed, the illustrious committee went further. It has not sufficed with all the above, or with renewing the cover provided to the private company that has been cleansing Beirut of its antiquities. It also started digging up old ministerial decrees imposing preservation orders on several archaeological sites in the center of the capital, with the aim of overturning them and removing the antiquities from their original locations, under the rubric of “dismantling and integration” – otherwise known as taking people for a ride. We have begun to fear that its third achievement will be to deem the Phoenician Hill to be another mere pile of stones which deface the heart of the capital and must be bulldozed away. Who knows? The committee might even find that the columns of Baalbak are not in their correct historical location, and should be dismantled and integrated into the Berdawni valley for the benefit of restaurant-goers. What is being done to Beirut today can be described – as during the Solidere days – as a large-scale cultural massacre. We are entitled to ask out aloud: what is the explanation for the extraordinary zeal with which Beirut’s antiquities are being squandered? Is it really the national interest? Is it a uniquely refined aesthetic view of how city centers can be beautified? Or is it – as rumored – something else? Naji Karam is Professor of Phoenician Art and Archaeology and former head of the Art and Archaeology Department at the Lebanese University. The views expressed by the author do not necessarily reflect Ama Ata's editorial policy. Por Brid - 8/03/2017 03:26:00 p. m.